Lord De Vesci’s magnificent mansion, which stands within a mile of the town of Abbeyleix, was built in the year 1774. It is in private ownership and only opens to the public 1 day a year. I was here 3 years ago and have done a few paintings on this subject in that time (here is one). I am still striving to be less ‘heavy’ in recent paintings. A few months ago I stopped using black as I attributed it to the sombre look in the work. Recently, however, I’ve reintroduced black and am careful not to overuse it especially in shadows. Generally black is not considered a colour and this and white are regarded as neutral additions to an oil painting. I think the way I use it is more like the way I use the colours. Its in the details picked out in the landscape in contrast to the lighter tones. This is like the watercolour method where details are painted last over a series of lighter washes of colour. At the moment I like this sketchy watercolour look in these oil paintings. The nature of oil paint does tend to lend itself to heavy ‘blocky’ paintings. As usual I’m using loads of solvent and no medium. Some of the paints are Alkyd oils and the extra transparency is a bonus especially in the thinly painted areas. Even painting over already painted areas (and these are still wet), as in the foreground grasses, produces a glowing colour. The colours used were Cadmium Yellow, Burnt Sienna and Cobalt Blue plus black and white. 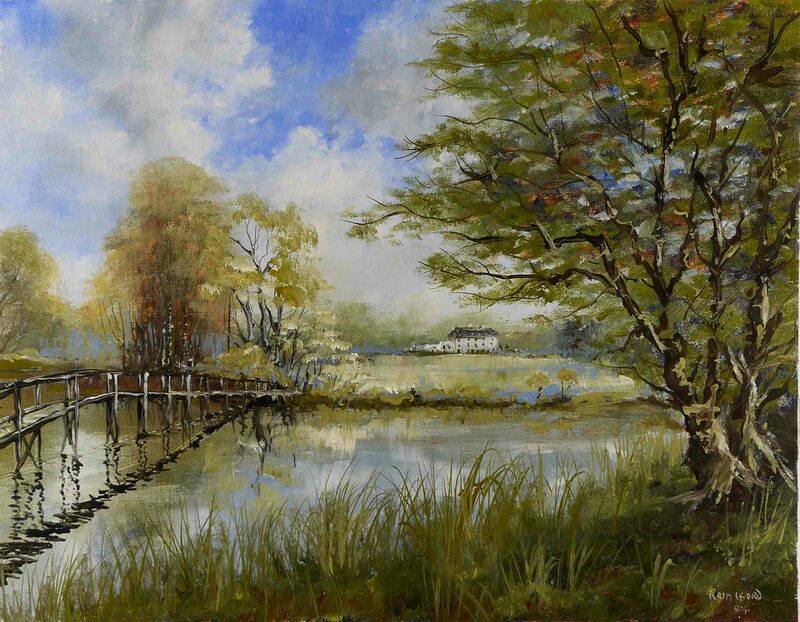 This entry was posted in Oil Painting and tagged Art, Culture, Education, Inspiration, Irish landscape, Oil Painting, painting, Pictures, Time lapse painting. Bookmark the permalink. Thank you Rosemary. I think the stodgy nature of oil paint pushes us in the direction of heavy painting. I probably should be painting in watercolours but the is a nice physical strength and permanence in oils. Lovely, Liam. although the house doesn’t take up much space on the canvas, comparatively speaking, it certainly dominates the scene – as it should! What a beautiful building. Thank you Marion. I’d say a lot of thought went into the planning of these ‘grand houses’ and their gardens in the 18th century.